BBC NEWS | South Asia | What now for Sri Lanka? The victory of Mahinda Rajapakse in Sri Lanka's presidential election is being seen as a vote in favour of a hardline approach towards resolving the country's long-running ethnic conflict. For many it signals a key moment in the country's history, where voters have picked a candidate heading an alliance with strong views on devolution of power to the Tamil minority, on the management of tsunami aid and on economic policy. Nationalist and Buddhist parties strongly backed Mr Rajapakse and they expect to play an influential role in his administration. The two main candidates, Mr Rajapakse and the main opposition leader, Ranil Wickramasinghe, had radically different approaches to the peace process and to economic policy. Mr Wickramasinghe had said he would restart stalled peace talks if elected, and also favoured greater foreign investment and privatisation. 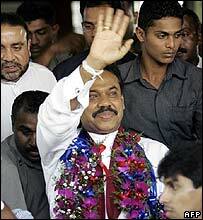 His defeat has come as a blow to business interests, particularly as the Sri Lankan economy is in crisis. The key factor in the election was the virtually non-existent Tamil vote in rebel-held regions of the north and east and areas like Jaffna town where the Tamil Tiger influence is strong. The push for a boycott apparently came from the Tamil Tiger rebels. There are some accounts of Tamils there being prevented from coming out to vote in polling stations located in government-held areas. Although some areas of Colombo saw a lower Tamil vote, in many other parts of the country, Tamils did vote in large numbers and Mr Wickramasinghe benefited. He also received wide backing from the Muslim community. But with the situation in the north and east, the effect of the normally critical minority vote was diluted. Many see it as a lost opportunity for the Tamils. "It was the one chance for Tamils to influence the incoming president and have a stake in future events," says SI Keethaponcalan, a Tamil lecturer at Colombo University. "Now there is every danger of them being ignored in future election campaigns." Analysts are divided on why the rebels pushed for a boycott, especially as Mr Wickramasinghe had campaigned on a peace platform. Some say the rebels are frustrated at what they believe is the failure of successive governments to press on with the peace process. Many Tamils living in the north and east genuinely believe that the Sinhalese-Buddhist majority will never allow them to enter into a power-sharing agreement. But others question the rebels' commitment to the peace process. They believe that by effectively sealing Mr Wickramasinghe's chances and helping usher in a hardline presidency, the rebels have laid the ground for confrontation. For the past few months there has been a smattering of violent incidents in the north, and shadow fighting in the east. There are some who fear that with the three-year-old ceasefire stretched to the limit, a possible return to hostilities cannot be ruled out. Sri Lanka's new president is a popular politician with strong grassroots support in the Sinhalese-dominated south. But Mr Rajapakse has never really played a leading role in Sri Lankan politics - even as prime minister he was overshadowed by the charismatic and controversial Chandrika Kumaratunga. But as executive president, he now has a chance to come out of the shadows and play a decisive role in shaping his country's future.